I’m really all about natural beauty regimes, I don’t think our skin needs to be exhausted and drained out with the millions of chemical products in almost every mainstream beauty product. Grandmas have been harping on and on about homemade beauty treatments for centuries now, much to the deaf ear of their daughters & granddaughters. Glitzy and glossy beauty products are easy to get behind, especially with most of them promising miraculous results. But tell me this, out of all the hundreds of things we try on our faces, hair, and bodies, how many actually make us feel like our skin is improving with time? For me, not too many. Except when I get messy in the kitchen, and then even messier in the bathroom. These are 3 of my fave luxurious, soothing, and organic home made beauty treatments, that are not your run of mill, aunty-next-door-who-wants-to-get-you-married recipes. These mixtures have been on my skin countless times ladies (and the men who can appreciate a good skin treatment) so I can personally vouch for them. There’s one for face, body & hair. Time to get cooking! Face: In India every knows about the mixture of turmeric and and gram (chickpea) flour, it is after all a part of our wedding traditions and goes back maybe even hundreds of years. Gram flour combats dullness and absorbs impurities, it’s also an excellent exfoliant. Add to this the all healing, all glorious turmeric and you have a winner. Turmeric is not only a powerful disinfectant (it used to be put on wounds before the modern medicine days) but is also anti fungal and antiseptic. It fights acne by reducing oil secretions and also lends a gorgeous glow to the skin. 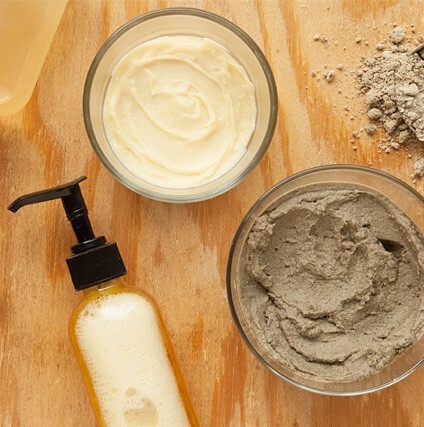 Here’s an amped up, tried & tested face mask recipe a la my mother. Mix all the ingredients into a thick, smooth paste. Stick it into the fridge or freezer for a bit to make it nice and chilled. Apply all over face & neck (whole body if you have the time and patience). Prance around your room for 30-40 minutes while it dries. Get in the shower, rub off in small circular motions so you get in a bit of a scrub, and don’t apply too much soap or any overly drying product on the skin afterwards, something mild should do. Spend the rest of the day basking in your soft, smooth glow. Body: Coffee, or caffeine actually, is an amazing ingredient to fight dull skin, cellulite and even stretchies. The old cold teabag trick has been known to kill under eye puffiness, but there are so many other uses for caffeine and its anti-inflammatory and antioxidant properties. You’ll find caffeine in all sorts of fancy beauty products, but why add all those extra chemicals & preservatives when you have a perfectly good scrub in your coffee maker! All you need to do is dry out the coffee grounds a bit, add a few lush ingredients and you’re good to go. You can even make a big batch & store it in your bathroom in a waterproof container. Here’s my recipe. Hair: One of my fondest memories as a kid was getting regular hair massages from my mom with a delicious blend of oils, and then waking up to softer, shinier hair and that stepping out of a shampoo commercial feeling (I was always obsessed with my hair, even as a kid). I would get out of the shower and throw my hair side to side, singing trashy 90’s songs in my towel, obsessing over how soft it felt and how glorious it would look in the sun. Such good memories. The closest I get to that natural childhood shine is when oil my hair at least once a week with this fabulous blend. Mix in a bottle. Shake extremely well before using as all the oils will settle according to weight. Take some in a small bowl and microwave for 30 seconds. Apply to hair, massaging scalp and hair throughly. Leave overnight, sleep with an old sheet or towel on your pillow. The next morning before showering wrap a hot towel around your hair so the steam can help it soak for 15 minutes. Shampoo and condition as usual. Use once a week for 1-2 months to notice change in hair texture, shine, and thickness 🙂 Proceed to whip hair back and forth like the queen you are! YAS GIRL.